We are sorry to report that our Control Group, one Steven Schapansky (not appearing in this episode) had a conniption fit over the lack of descriptiveness in this episode’s title. Wait until he gets a load of next week’s. Meanwhile, meet the Drakh! Watch Delenn take charge! See Susan roll her eyes at her next assignment! Let your breath catch in your throat as Babylon 5’s power couple prepare to go their separate ways! All this, and some pretty Star Trek-ish chair acting on the White Star bridge, too. I would say “touch passion when it calls your name,” and Marcus always sounded to me like he was quoting. I also have met several douches, who would totally say something like “is this how you treat all your former lovers?” and they sound exactly like that git. Undoubtedly one of the best moments in the whole season… Until that line, when the spell is broken, I sigh & role my eyes. First time comment , Long Time listener!! Big fan of B5 and love the podcast!!! 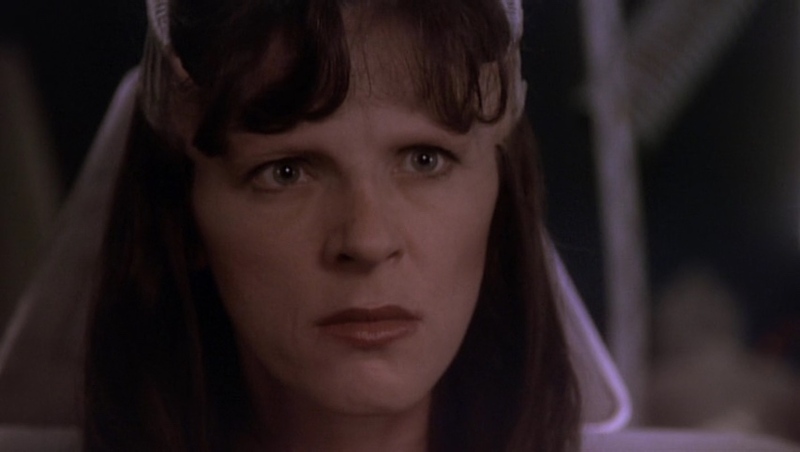 This is one of my favorite episode due to it showing just how passionate and deadly Delenn could be. Talking about Delenn I got to meet Mira Furlan over this past weekend (April 1-2) at a local Comic Convention. I got her autograph on a B5 Limited Edition Collector’s Series Ambassador Delenn Action Figure. She was extremely nice and very fun to talk to. I spoke to her for a good 10 minutes about Andreas Katsulas and Jerry Doyle. Also said how much I loved her delivery of the line “The only human to survive a Minbari assault is behind me you are in front of me, if you value your lives be somewhere else!” She saw how my hands were shaking and asked if I was nervous. I told her No it was because of nerves due to my back being so bad. So she took my hand in both of her’s and asked if I was going to be okay. I said now that I have meet her I will be.